Want a cute Valentine’s Day print to add to your decor this month? 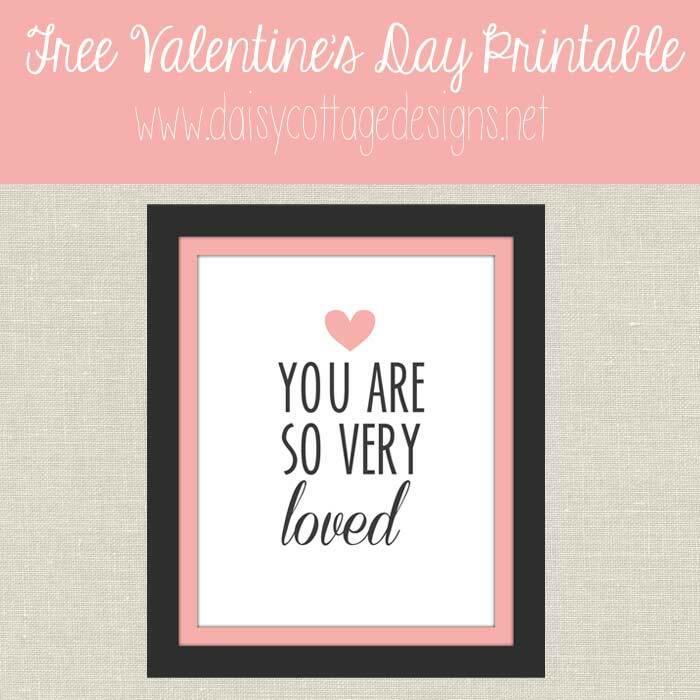 This “You Are Very Loved” free printable might be just what you’re looking for. It’s simple and fun, and would definitely look great in your home all year long. In fact, I might be printing this out and putting it in my little girls’ new room. This free 8×10 printable will print out on a regular sized piece of paper. All you’ll have to do is trim on the pink line and stick it in an adorable frame. Ready to get one for yourself? You can download the PDF here. I’m just learning to crochet. My question is…how do I keep the yarn from curling as I crochet? I also just finished a scarf for my granddaughter. It curves and I want to know how to make it straight. Thank you. I was making the granny square baby blanket, I found the pattern on pinterest, now when I click on it I cant see the pattern, my blanket is almost done. Please help. I am attempting to download the free pattern for the ‘Springtime Stripes Afghan’ and whenever I click on the thumbnail photo it takes me to a page that doesn’t include the pattern. Can you please direct me to the correct link for this beautiful pattern. I love your patterns but for some reason when I click on them to be taken to the free patterns – it doesn’t go anywhere and won’t get me to the free pattern. When I click on the thumbnail to get the free pattern it takes me back to the home page. What am I doing wrong? I’m frustrated by trying to download the free pattern for “Nana’s Favorite Baby Blanket”. Every time I click on the link to the free pattern, I get directed to a Valentine’s Day Printable messages page with no pattern for the afghan in sight. Could you help please? I’ve enjoyed your patterns in the past very much, some very adorable projects. Thank you. What happened to your Rainbow Chevron Blanket pattern? This was the link for it. I’m using it for a blanket I started a few days ago, and now I have no reference for it.